CAMPS and more camps! HOW CAMP SUPPORTS HEALTHY CHILD DEVELOPMENT SAN DIEGO MOMpreneurs Meet 7 local moms in business SINGLE PARENT? FIND YOUR TRIBE! Individualized therapy plans that put every child with autism first. Armed with both expertise and compassion, our team of clinical professionals create personalized treatment plans for each and every child with autism, empowering them to achieve their maximum potential and furthering their ability to do wonders. To speak to an autism specialist, please call 855-77-AUTISM, or visit centriaautism.com to learn more. Christine was skeptical but lost 33 lbs and 2 sizes in 60 days. “I wanted to get healthy, get my weight down, feel and look better and after 6 months of coming, I’ve lost 90 lbs. Thank you!” Yvonne F.
Anselmo lost 33 pounds in 3 months, 4 belt loops and even stopped snoring. Sandy lost 25 pounds in 2 months. She went from a size 14 to a size 10 and kept the weight off for 1 year. (619) 333-8782 Lori lost 38 pounds and has gone from a size 14 to a size 8 and she feels terrific. Get to know www.SanDiegoFamily.com, where you’ll discover a plethora of awesomeness for parents. Your Voice Matters! Share your thoughts and enter to win amazing prizes! Corvette Diner Gift Cards, Tickets to SeaWorld, UltraStar Cinema Passes, an American Girl Doll, Museum Passes & more! Galaxy Taco, a casual restaurant with indoor and outdoor seating, celebrates the culture and cuisine of Mexico. Galaxy Taco’s Sunday Brunch is delicious. The lunch menu is a sumptuous interpretation of Mexican street food with an emphasis on seafood and tacos; additional family-style offerings are available for dinner. The full bar specializes in agave spirits and regional beers from San Diego and south of the border. Enter now to win a $100 Galaxy Taco gift card. Contest ends May 23. Get ready to ride the tide! Experience Tidal Twister, SeaWorld San Diego’s all-new dueling roller coaster, which makes its debut May 24. Featuring highspeed turns and upside-down twists, this unique ride mimics the power of the ocean, accelerating to 30 mph. Riders will feel like they are riding the tide along a tight figure-8 track that includes a dynamic zero-gravity roll. Enter to win a family 4-pack of tickets to SeaWorld San Diego to enjoy this thrilling ride. Contest ends May 23. The San Diego County Fair invites guests to enter an “Oz-some” world inspired by the classic tale, The Wonderful Wizard of Oz. Journey to the Emerald City and meet magical new friends along the way! Muster the courage to experience a whirlwind of carnival rides, expand your brain through creative and educational exhibits, and warm your heart making new memories with friends and family. You’re sure to discover “There’s no place like the Fair!” Enter to win a 2-pack of tickets to the San Diego County Fair. Contest ends May 23. Enjoy Even MORE Family Fun! Distribution Locations San Diego Family Magazine is distributed at more than 1,500 locations. Pick up a free copy at: Albertsons, Ralphs Supermarkets, McDonald’s, Sombrero Mexican Food, Round Table Pizza, Wahoos, Fleet Science Center, schools, libraries, medical offices and more. Subscriptions Receive 12 issues for $18, plus our annual publication, Out & About with Kids. Orders must include payment to San Diego Family Magazine. Mail to: SDFM, Subscriptions, 1475 Sixth Ave., Fifth Floor, San Diego, CA 92101; or call 619-685-6970 to use a credit card. Find editorial guidelines at SanDiegoFamily.com (“Editorial” at the bottom of the home page). Submission does not guarantee publication. We reserve the right to edit all submissions. Advertising/Marketing Advertising/Marketing Representatives Tony Andrews 619-685-6977 • tony2018@SanDiegoFamily.com Point Loma, Pacific Beach, La Jolla, North County Coastal Giovanni Baldan 619-685-6987 • giovanni@SanDiegoFamily.com	South Bay, San Diego Downtown, Uptown Nicole Maggio 619-685-6971 • nicole@SanDiegoFamily.com	North County Inland (includes Scripps Ranch) Crystal Grobner 619-685-5860 • crystal@SanDiegoFamily.com	East County 619-685-6970 • family@SanDiegoFamily.com	Clairemont, Linda Vista, Mission Valley North and Mira Mesa San Diego Family Magazine is published monthly by San Diego Family Magazine LLC. Copyright 2019. All rights reserved. Reproduction in whole or in part without permission is prohibited. Opinions expressed by contributors are not necessarily the opinions of this publication. MOMpreneurs (women who balance motherhood while running a business) because they found a need and filled it. San Diego Family’s contributing writer, Anne Malinoski, interviewed local moms who are on different career paths. Read about them on page 22. Also check out the Readers Page (p. 46) to see some happy, local moms with their kids. It is so much fun being a mom (and grandma)! As we have said many times, summer is for camps. It’s time for the kids to take a break from the school routine and have other adventures, exploring and learning in different ways. Many times this learning isn’t out of a book — it’s growing in self-confidence and leadership, experiencing new avenues that might be uncomfortable in the beginning. Find more benefits of camp on page 16. If the kids have been in day camp for a while, they may be ready for overnight camp. On page 20 are tips to help get them ready for a first-time overnight experience. Look over the advertisements in this issue and find great summer camps — give the companies a call for more information. May is National Hamburger Month, so I want to give a shout-out to Hodad’s in downtown San Diego and Ocean Beach — it has great hamburgers (piled high with ingredients) and delicious shakes. Another great place for hamburgers is Maggie’s in Serra Mesa. It’s in a small strip mall, so off the beaten track, but all the food is yummy! Moms — enjoy going out to lunch or dinner on Mother’s Day (May 12), whether it’s to have a hamburger or something else. Happy Mother’s Day! sharon@sandiegofamily.com Main Office: 1475 Sixth Avenue, Fifth Floor, San Diego, CA 92101 Phone: 619-685-6970 Fax: 619-685-6978 E-mail: family@SanDiegoFamily.com Mission Statement To enhance the quality of life for San Diego County families by providing information and resources that support the importance and pleasure of parenting. Local moms share what “the perfect Mother’s Day” means to them. Teresa James of San Carlos, mom to Norah (1) and Aria (3): A perfect Mother’s Day is enjoying my family and doing something low-key and fun for everyone. Their happiness is what I enjoy most! Lupita Ortega of La Mesa with daughter Amaranta (14 mos. ): Brunch and a walk near the beach with my husband and daughter, followed by a family celebration with the moms in my life who have provided a lot of support and guidance (mom, sister, mother-in-law). Grety Moreira of Kearny Mesa, mom to Izyk (4) and Izabella (7; not pictured): I crave a fun family day! I love the outdoors, so a new hiking spot where the kids can play would be perfect — somewhere that gives me a little relaxation, while still enjoying my family. Lydia Grecco of San Carlos with son Keenan (2): Packing a lunch and heading to the park with Keenan to play on the playground and soak up the San Diego sun at the splash pad. Find more photos of local moms and kids on the Readers Page (p. 46). Explore one of the largest seadragon habitats in the world. We are looking for surrogates now! Get in the pool today! FREE Introductory Lesson* *Check for available times & enroll today. Don’t miss the San Diego Museum of Art’s student exhibition Young Art that runs through May 12. On Sunday, May 5 from 11:30am–12:30pm San Diego’s Best Spots for Mom’s Night Out students will be on site to speak According to San Diego moms, some of the best local spots to visitors about the content of for a night out with the girls are movies and a meal at The Lot their artwork and the creative in Liberty Station (www.thelotent.com), drinks at Rose Wine Bar process. in South Park (www.therosewinebar.com) or Madison on Park in Now in its 44th year, the University Heights (www.madisononpark.com), a concert or dancing juried exhibition features the at Belly Up in Solana Beach (www.bellyup.com), dinner at C-Level on finest examples of artwork by Harbor Island or The Patio on Lamont in Pacific Beach San Diego County students in (www.thepatioonlamont.com); and getting creative at the Pinterestgrades K­–12. This year’s theme, come-to-life DIY studio in Hillcrest, AR Workshop (www.arworkshop Breaking Traditions, inspired .com/sandiego). So, what are you waiting for? Grab a few friends and students to submit work using plan a fun night out! color, line and shape, while considering important changes that occurred in the 20th Century and broke traditional ideas of what art should look like. The exhibit is located in Gallery 14/15, near Panama 66 in Balboa Park. Admission is free. Learn more at www.sdmart.org/exhibition/young-art-2019breaking-traditions. Share your thoughts with us for a chance to win amazing prizes (gift cards to Corvette Diner, tickets to SeaWorld, UltraStar Cinema passes, an American Girl doll and more)! Participate in our Readership Survey at www.research.net/r/sandiegofamily by May 31. New Rules at the Happiest Place on Earth Planning a trip to Disneyland soon? Note: Effective May 1, strollers greater than 31” in width and 52” in length (and stroller wagons) will be prohibited. Learn more about Disneyland Resort rules at https://disneyland .disney.go.com/park-rules. Join our 2nd through 9th grade camps and explore the disciplines required to build a model railroad! From track laying to scenery construction, campers will make a themed scale model by applying design principles, and will learn why engineers use arches and triangles in the construction of railroad bridges. FOR PRE-K THROUGH 8TH GRADE! Pre-K through 8th grade • Paleo FBI • Remarkable Reptiles • Guardians of the Globe • Wonder Women in Science • And more! How Summer Camp Supports Healthy Child Development Summer camp often conjures happy images of playing outdoors, trying new activities and making friends. Because camp can provide such a positive and safe environment away from home to do all these things, many campers (and their parents) look forward each year to the next fun-filled, camp experience. According to the American Camp Association (ACA), summer camp is about much more than “just” fun. It helps kids develop social skills — leadership, communication and participation; build personal traits — responsibility, resourcefulness and resilience; and gain adeptness in community living — caring, fairness, citizenship and trustworthiness. Read on to discover the many ways that camp enriches the lives of children and, ultimately, makes our community a better place. Kids Grow and Develop at Camp “In the camp community, the skills and traits that kids get from camp are often referred to as the four Cs: compassion, contribution, commitment and character,” explains ACA staff. “For years, campers’ parents have reported that when their children return home from camp they are more caring, understand the importance of giving, are more equipped to stand up for what they know is right, and are willing to be more responsible. American Camp Association (ACA) Youth Outcomes Studies show: •	96% of campers said camp helped them make new friends. •	93% of campers said camp helped them get to know kids who were different than themselves. •	92% of campers said that people at camp helped them feel good about themselves. •	74% of campers said they did things at camp that they were afraid to do at first. ACA accreditation acknowledges programs committed to the health, safety and overall wellbeing of both campers and staff. From coding and game dev to robotics and design, your child will develop in-demand skills and ignite lifelong passions—all in a fun, inclusive environment. Choose from 50+ innovative courses and join our community of over 400,000 alumni. Get ready for the best summer ever! Get a brochure and ﬁnd a camp near you! SUMMER CAMP There are many types of summer camps for kids, but few will have campers interacting with rhinos and giraffes, meeting meerkats, or getting up close to cheetahs. Summer Camps at the Zoo and Safari Park are hands-on, join-in, be-a-partof-it fun, with options for kids of all ages. If your kids love animals, jump in and make your plans for a summer they’ll never forget! Call 619-718-3000 to make your reservations today! Girl Scout camps for every girl! Open to all girls in grades K-12. Financial aid available. “Camp also provides children with a community of caring adults, who nurture experiential education that results in self-respect and appreciation for human value. It is a supportive environment that encourages kids to understand they are part of a larger community.” Along with the many benefits of personal and social development, camp can also mitigate some of the negative effects caused by kids spending too much time in front of electronic screens the rest of the year. Research shows that even small amounts of time outside improves a child’s ability to focus, lowers childhood obesity rates, establishes connections with nature, and allows kids to engage their imaginations while discovering free play. Camp Helps Kids Prepare for School and Beyond Former campers state that camp helped prepare them for school and the workplace in a groundbreaking national study by the ACA that explores how camp prepares youth for college, career and life. They also report that relationship skills, appreciation for others’ differences, emotional regulation, and responsibility were among the things they learned at camp that they consider most important in their lives today. Sending kids to summer camp can help prevent the dreaded “summer slide” (the tendency to lose academic skills over summer). According to the ACA, camp is an experiential learning environment that helps stem summer learning loss. Many camps offer a plethora of activities for campers that includes: rocket building, pottery, dance, geocaching, STEM activities and so much more. 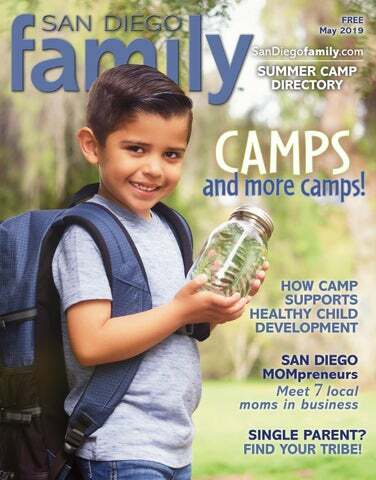 To discover the perfect summer camp for your child to thrive, check listings throughout this issue and visit San Diego’s summer camp guide at www .sandiegofamily.com/resources/summercamps-and-programs. v Lisa Pawlak is a contributing writer and Encinitas resident. Avoid the Summer Slide with Mathnasium (grades 2-12) Kids can lose 2.6 months of learning over the summer. That loss adds up and the learning gap widens. Mathnasium closes the gap by making math make sense! Sony KOOV is Coming to Mathnasium With over 50 robot recipes, Mathnasium will teach your student how to design and build robots with colorful blocks and bring their creations to life with code. Shrek the Musical, Jr. The Hobbit The Addams Family. One-Week 9:30 a.m.–12:30 p.m. & 12:30–3:30 p.m.
TechKnowHow.com (877) 432-0970 Our 25 th Year! Parents Love Us! life than the first time at sleepaway (overnight) camp. How do you prepare a child — and yourself — for the big event? Drawing on my own experience as the parent of a teenage son who’s a happy camper, as well as conversations with other parents, here are six things we recommend to get ready for overnight camp. Prepare for Camp Together It’s best for kids to take ownership of this exciting experience. To do that, prepare for camp with your child: shop together for items on the packing list and pack jointly using luggage that isn’t too difficult for the child to carry on his own. Build excitement by talking about the incredible things campers will experience, and explain rules and expectations of camp staff. Have a Sleepover or Two Your kids will be away from you for an extended period of time — make sure it’s not their first overnight away from home! Some kids have no problem adjusting; others may need practice. Organize a couple sleepovers at different friends’ houses to get them used to being away from home. If needed, schedule a couple more before departure for camp. they’re going to meet lots of other kids and make new friends. Ask Camp Staff about Communication Find out what the camp policy is when it comes to communicating with your child via email, letter or care package. What is the recommended number of communications? Are there rules about what to send in a care package? If toys are permitted, choose things that kids can enjoy with other campers, such as Frisbees and small games, instead of toys geared for an individual. For our son’s first sleepaway camp, my spouse and I sent several decks of cards in a care package. The kids ended up playing cards with camp counselors until late at night. Don’t Hang Around too Long When you finally arrive at camp for drop-off, do your kids (and yourself) a favor and leave as soon as they’re settled in. Walk them to their cabin (if permitted), help them unpack (if necessary), and then extract yourself as quickly as possible. Kids are eager to meet other kids and there’s nothing as embarrassing as a parent who lingers for what appears to be no good reason. It also makes goodbyes more difficult for anyone who is apprehensive. Let your child start bonding and connecting with counselors and other kids on his own. All Will Dance. Each Will Grow. Some Will Fly! This Mother’s Day, we’re celebrating local moms who inspire us with their passion, leadership and creativity. Each of these women founded her business while managing a family — the kind of achievement that gives fellow moms goosebumps and happy tears. Soak up their inspiring stories and be sure to follow them online. It feels so good to support hard-working women! Kyla Dahrling Tiny Trucker Fallbrook mom Kyla Dahrling wouldn’t have launched a fashion brand if her employer of 12 years had granted her request to shift to part-time. “After having my second child, I found it hard to juggle a full-time career and being a mom,” she says. Bothered by the lack of opportunity for part-time professional women, she left her pharmaceutical sales career and began designing trucker hats for babies. Her products are both functional and fashionable — offering sun protection as well as style. Today, her line includes mother-baby matching sets, and a wide selection of hats in sizes to fit the whole family. Dahrling proved that a team of women — including mothers, flexworkers and part-timers — could build a hugely successful brand. Tiny Trucker employs 27 women and grew by 300 percent last year. “We are 100 percent owned and operated by women and we are all so supportive of one another,” says Dahrling. Her advice to would-be entrepreneurs: “Recognize your weaknesses and surround yourself with people who have strengths in those areas.” Follow Tiny Trucker: www.tinytruckerco.com Instagram: @TinyTruckerCo Facebook: @TinyTruckerCo v Anne Malinoski is an award-winning contributing writer and mother of two boys. She loves to shop small and support local families. Be by your child’s side as our instructors teach them basic gymnastics on special equipment designed for their age. WE OFFER BIRTHDAY PARTIES! Are you ready for fun, adventures & field trips? in short supply for single parents, but with a little work and the right approach, you can find your people. Here are a few ideas that can help. what “single” means when growing a tribe. Of course, it is helpful to seek out and team up with other single parents. “Me too” conversations go a long way to soften the edges on days when you need reminding that you’re not alone in your solo parenting efforts. Yes, similar circumstances create a common bond, but don’t limit your tribe to only single parents. Every family with children faces challenges, and even those with two parents get stretched thin with long hours at work, a spouse’s deployment or a child with special needs. All parents need help with carpooling, an emergency contact on a form, or a backup babysitter when life goes off the rails. Make note of other parents with similar lives and schedules at the park, in playgroups or at your child’s school. Then say hello and make a connection. Single or not, parents bond over helping each other carry the load. Project-based Tech Education for Kids & Teens Learn3D 3DModeling, Modeling, Coding, Coding, Artiﬁcial Intelligence, Robotics, Learn Artificial Intelligence, Robotics, Game Game Design, Design, Filmmaking, and more at pretigious universities in the US and Canada like Filmmaking and more at prestigious universities in the U.S. and Canada like Stanford, Harvard, and UC San Diego. Stanford, Harvard and UC San Diego. Includes free Dippin’ Dots for the guest of honor. Must mention San Diego Family Magazine to redeem offer. One per party. Explore deeper possibilities and develop character! Day camp includes ground and aerial acrobatics classes. Kids love aerial silks, trapeze, lyra, pole, tumbling, handstands, flexibility, and acrobatics. This camp is for kids with all levels of experience. Low student/teacher ratio, adult professional staff. Two convenient locations: Morena and Miramar. Our Summer Adventure Camps offer a fun-filled active summer for youth ages 5-15. Our skilled staff and amazing programs and activities will ensure a rewarding camp experience. Five convenient locations throughout north coastal San Diego: Carmel Valley, Del Mar, Solana Beach, and Encinitas. We offer FLEXIBLE & AFFORDABLE camp options. Specialty Camps, Sports Camps, Day Camps & Leaders-In-Training program. Registration opens March 1st. *Financial assistance is available on a first-come, first-served basis for those who qualify. Military discount available for families that qualify. Summer Camp n Registratio now open! their children benefit from spending time with people whose lives look different from theirs. Think about inviting other family members, friends and neighbors with experience and perspectives that demonstrate what different family relationships look like. Don’t be shy about asking people at different stages and seasons of life like empty nesters or seniors who may have extra time to spare. You might discover that your family brightens their lives as much as they brighten yours. With Purchase of 8 Classes $30 value. New students only. parenting groups on Facebook or Meetup.com yields a variety of groups meeting regularly all over San Diego County. Some are specifically for solo parents and others for just about every subgroup of parenting imaginable, including geographic area, birth years of children and specific interests like baby sign language. Remember that parenting is the common bond and “single” parent is just one descriptor. Try a couple of groups based on shared interests to find which feel like the best fit. JOIN ACCE ONE Y â&#x20AC;&#x201C; SS TH EM A 18 Co LL! nven Locat ions ient San D Across iego! Summer at the Y is all about family, fun and coming together in active and healthy ways. We are more than a gym or a pool, we are a place where people belong and develop meaningful relationships through our numerous programs and activities. From studio classes to swim lessons to camp, youâ&#x20AC;&#x2122;ll find a safe, positive environment for you and your family to learn, grow and thrive. Join our community and discover your second home this summer. BALBOA SCHOOL BUILDS BI-LITERATE COMPETENCY BY TEACHING ALL SUBJECTS IN BOTH ENGLISH & MANDARIN. Integrated Math program combining California Math with Singapore Math. th th • • Parent withcredentialed credentialed teacher support for grades TK–12 Parent choice choice with teacher support for grades TK –12 • • Flexible funds with hundreds of vendors Flexible instructional instructional funds with hundreds of vendors • • Vendor classes in CORE extracurricular subject areas Approved vendors at localand learning centers • • UC/CSU customizedinstruction instruction high school UC/CSU and and customized high school trackoptions options • • Local field social trips and regional community events Field trips, clubs and activities • WASC accredited Parents and Teachers working together to grow a community of passionate leaders! Parents and teachers working together to grow a community of passionate leaders! According to Dr. Maria Montessori, children learn best in an environment that demonstrates love, trust, understanding, patience and consistency. Students excel academically while experiencing cooperation, respect, self-confidence and the joy of learning. Contact these local Montessori schools for more information. Now it’s your turn to do the spoiling! Make Mom feel like the queen that she is by treating her to a bunch of extra-special Mother’s Day happenings that’ll bring a big smile to her face (and yours). Plan fun family adventures with Out & About with Kids! 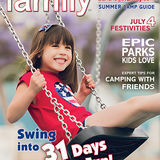 Access the digital edition at www.sandiegofamily.com. friday | 3 Don’t forget to call to confirm dates, times and admission prices. Viva La Música at SeaWorld. Don’t miss this Latin concert series featuring vibrant tunes, sumptuous food and fun! Today, tomorrow, May 11-12, 18-19 and June 1-2; visit website for hours and admission. Interstate 5, exit SeaWorld Dr., San Diego. www.seaworldsandiego.com FREE Kids Workshop at The Home Depot: Blooming Art. Children can make Mom a handmade blooming art piece, and decorate it with paint. 9 am-noon. For participating locations and to register, visit www.homedepot.com/workshops. Lilac Festival at Fort Cross. Explore a five-acre lilac farm and enjoy hay rides, hoedowns, a petting zoo, a reptile show, tomahawk throwing, fairy and dino garden making, and other activities. Through May 12. Saturdays, 10 am-5 pm; Sundays, noon-5 pm. $20-$35. 4425 Hwy. 78, Santa Ysabel. Details at www.fortcross.com/lilac-festival. sunday | 5 Cinco de Mayo FREE Fiesta de los Peñasquitos. At 10 am, see the parade showcasing marching bands, community organizations, school groups and more. Starts at Sun Devil Way and ends at the street fair on Black Mountain Rd. (between Carmel Mountain & Twin Trails). The fair opens at 11 am and offers more than 150 booths, food, a car show, carnival rides and other attractions. www.rpcouncil.com/fair-2019 Miracle Babies Superhero 5K & Family Fair. 8 am-noon. Proceeds support families with critically ill babies in the neonatal intensive care unit (NICU). NTC Park at Liberty Station, 2455 Cushing Rd., Point Loma. To register, visit www.miraclebabies5k.org. years old. 9-11 am. 12850 Brookprinter Place. Visit www.powaygymnastics.com for details. Visit www.mbmacademy.com for our WEEKLY Elementary Summer Camps featuring STEAM, DRAMA & MORE! WASC accredited. Se habla español. Mother’s Day Celebration at The Flower Fields. Watch performances by the Rancho Buena Vista High School’s Ballet Folklorico and share a spectacular view of 50 acres of Tecolote Ranunculus flowers and other blossoms. 9 am-6 pm. $9-$18. 5704 Paseo Del Norte, Carlsbad. www.theflowerfields.com Mother’s Day Brunch Buffet at The Westgate Hotel. 10 am-3 pm. 1055 Second Ave., downtown San Diego. For fees and reservations, visit www.westgatehotel.com. “Seussical, The Musical.” See May 3.
tuesday | 14 “Roald Dahl’s Charlie and the Chocolate Factory.” Tonight & tomorrow, 7 pm; May 16 & 17, 7:30 pm; May 18, 2 & 7:30 pm; May 19, 1 & 6 pm. For tickets, visit website. For ages 6 & up. San Diego Civic Theatre, 1100 Third Ave., downtown San Diego. www.broadwaysd.com Don’t forget to call to confirm dates, times and admission prices. Brunch Cruise by Flagship Cruises & Events. Complimentary champagne and mimosas, gourmet food selections and live music. 10 am-noon & 2-4 pm. For reservations, go to www.flagshipsd.com/ cruises/mothers-day-brunch-cruise. Summer Camp Planning Made Easy Discover tons of unique summer camps and programs in San Diego Family’s Summer Camps & Programs Guide. BACKPACK* with $75 purchase *With this coupon only. Excludes sale items. Calendar • May Parent’s Nite Out at Elite Gymnastics Academy: Support Our Troops. Kids, ages 4 & up, have a great time with gymnastics, games and lots of play. 6-10 pm. $20. Register online. 1817 John Towers Ave., El Cajon. www.elitegymnastics.com FREE Ocean Beach Kiwanis Kite Festival, Off-Street Fair & Carnival. Kite building and decorating, prizes for the best decorated kites, professional kite fliers and kite demos, crafters, gourmet food, live music and more. 10 am-4 pm. Robb Field, 2525 Bacon St. www.oceanbeachkiwanis.org FREE Hot Rods & Cool Treats. Test your carnival game skills, build your own sundae, vote for your favorite car in the classic car show and hang out at the Fun Zone. 11 am-2 pm. Carnival tickets, food and drinks available for purchase. Pine Avenue Park, 3333 Harding St., Carlsbad. www.carlsbadca.gov/parksandrec FREE Fiesta del Sol. An exciting lineup of performers, food, merchants and a Kids Zone with rides, games and hands-on activities. Today & tomorrow, 9 am-9 pm. Fletcher Cove, Solana Beach. www.fiestadelsol.net Space Day at San Diego Air & Space Museum. Get the chance to touch a meteorite, build and fly a paper rocket, meet space experts, design your own space patch and more. 10 am-2 pm. Adults $19.95 ($3 off coupons available online); ages 17 & under free. Balboa Park. www.sandiegoairandspace.org FREE El Cajon’s America on Main Street. This year’s event has an “Out of This World” theme to celebrate the 50th anniversary of the 1969 lunar landing. Live bands and dance performances, a light show, kids’ activities, a scavenger hunt, vendors and more. 2-9 pm. Main St., between Magnolia & Avocado Aves. www.americaonmainstreet.org FREE How-To Festival. The San Diego Public Library, in partnership with California Coast Credit Union, hosts this interactive, educational event where 20 participating libraries offer various community presentations and workshops that visitors, young and old, can enjoy. 11 am-3 pm. Details at www.sandiego .gov/blog/how-festival-library. RVA’s full-time program serves students in grades TK-8, with classes based on ability rather than age. Calendar • May to Juniper, downtown Escondido. www .escondidochamber.org/grand-avenue-festival “Wizard of Oz” by CYT San Diego. See May 11. Unforgettable Birthday Experiences Happen Every Day at San Diego Ice Arena! Sunday, kids & family Spanish classes in Balboa Park & La Jolla, and NEW Mandarin classes at the SD Chinese Historical Museum ! Daily o Field Trips to Zo & Museums in Balboa Park! OPEN 7 days a week. Suitable for 0–12 yrs. Socks Required. Calendar • May saturday | 25 FREE Open Cockpit Days. Select aircraft will be open for visitors to experience Marine aviation from a pilot’s perspective. Today & tomorrow, 9 am-3:30 pm. Flying Leatherneck Aviation Museum, 4203 Anderson Ave., San Diego (entrance is on Miramar Rd.). www.flyingleathernecks.org FREE Santee Street Fair & Craft Beer Festival. 10 am-6 pm. Town Center Pkwy. & Riverview Pkwy. www.santeestreetfair.com Port of San Diego Festival of the Sea. See page 33. 1st Lesson is FREE! Enroll Anytime! A Chance for New Moms and Dads to bring baby along to the movies they want to see! Crying, feeding & diaper changing expected! EVERY WEDNESDAY AT 10:30AM & 7PM Early bird pricing applies to both showtimes. A delightful interactive experience for the young and the young at heart. OPENING NOWFEBRUARY OPEN! 15.
friday | 31 KIDZ BOP World Tour 2019. See the KIDZ BOP Kids perform today’s hottest hits in this must-see, interactive show. 7 pm. Cal Coast Credit Union Open Air Theatre at SDSU, 5500 Campanile Dr., San Diego. For tickets, visit www.kidzbop.com or www.livenation.com. More fun happenings await at sandiegofamily.com. Our only priority is your child’s health. That’s why parents count on Children’s Physicians Medical Group. Want us to spread the news? Email jenny@sandiegofamily.com and include the name of the event or activity, a brief description, event address, date, time, cost, contact number and website. Submission does not guarantee publication. Deadline for the July issue: June 1. In partnership with Rady Children’s Health Network, CPMG brings you the most comprehensive pediatric health care in San Diego County. We’re the region’s only pediatric medical network specializing in children’s health. From babies to teens, we’re there for you in a big way. Creative, fun parties for kids 2 & up, in your home, yard or park. Crafts at preschools & camps too! We bring everything & clean up! We can theme a craft to fit your party! • Wooden Yard Decorations • Jewelry Holders • Canvas Tote Bags ... and More! We Do Large Events Also! Special Events, Themed Weeks, Dress-up Days, Dodge Ball, State-of-the-art Tech Lab, Pool, Air Hockey, Arts & Crafts, Water Balloons, and Much More! 5-n-1 Licensed Combo Multiple Themes! Clean Units! Insured! Free Delivery & Set-up! Other Interactive Games Available! Share your thoughts and enter to win amazing prizes! Corvette Diner Gift Cards, Tickets to SeaWorld, UltraStar Cinema Passes, an American Girl Doll, Museum Passes & more!